If you believe the official statistics, 20% of all tattooed people live to regret their decision. That’s a lot of people and a lot of lasers – but it doesn’t mean that tattoo artists have suddenly started doing a terrible job. It’s all just numbers, isn’t it; as more people get inked, more people grow to hate their choice. Luckily, tattoo removal methods have advanced a long way since the days of dermabrasion, chemicals or simply cutting unwanted tattoos off the skin. The most recent gold standard of getting rid of ink was the Q-switch laser, a method that uses heat energy to break up the insoluble ink particles that make up a tattoo until they simply break apart. Because this method produces relatively quick, painless results with little scarring, these lasers are still extremely popular. But now there’s something better – Picosure. 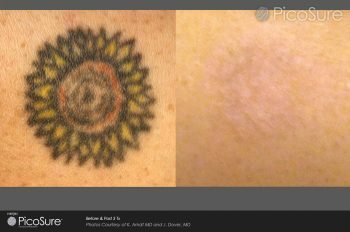 Picosure tattoo removal uses no heat whatsoever; instead, it works by hitting the ink particles with pulses that, while they’re only a trillionth of a second long, pack such a massive impact that the ink particles simply shatter into teeny tiny pieces that can then be easily absorbed by the body. In essence, it’s like hitting a grain of sand with an axe.This means that you’ll need less Picosure tattoo removal sessions and get a cleaner, better result with minimal damage to the surrounding skin. Picosure is especially useful for treating tattoos with stubborn blue or green ink, or those that have not responded properly to laser treatment. Here at Pulse Light Clinic , we’re thrilled to be able to offer Picosure laser treatment to anyone who wishes to remove a tattoo. Of course, every tattoo is different so be sure to call in for a consultation – our specially-trained team will take a look and let you know what results you can expect to see and how long it may take to see them.